Prototype: German State Railroad Company (DRG) class 89.80 steam tank locomotive. Former Mecklenburg class T 3b branch line locomotive. 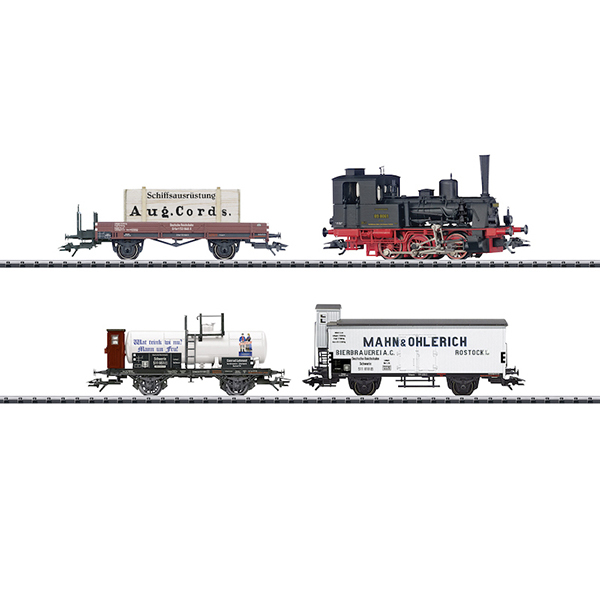 DR type X low side car without a brakeman’s cab with a crate of ships equipment “August Cords”. Privately owned tank car with a brakeman’s cab, used on the DR. Version as a tank car from Original Lehment Rostocker, theme “Mann und Fru” / “Man and Wife”. “Mahn und Ohlerich” beer car with a brakeman’s cab. The train looks as it did in the Twenties/Thirties. Model: The locomotive has an mfx digital decoder mfx and extensive sound functions. There is a miniature motor in the boiler. 3 axles powered. Traction tires. The frame is detailed with a representation of Allan valve gear. The dual headlights change over with the direction of travel, will work in conventional operation, and can be controlled digitally. Maintenance-free warm white LEDs are used for lighting. There is a clear view through the cab. The locomotive has many separately applied details. The frame and body for the tank car are finely modelled. The cars have spoked wheels. The cars have NEM coupler pockets and a close coupler mechanism. The beer car has a Württemberg brakeman’s cab. Total length over the buffers approximately 43 cm / 16-15/16".